Insignia of the 1st Armoured Division. The 1st (United Kingdom) Division, formerly known as the 1st Armoured Division, is a division of the British Army. It has recently returned home from being stationed in Germany. Originally formed in November 1937 as the Mobile Division, it saw extensive service during World War II and was disbanded afterwards; reconstituted in 1976, it remains in service. It should not be confused with the 1st Infantry Division, which saw service in World War II as a separate formation. The division was formed in November 1937 on the initiative of General Sir Archibald Montgomery-Massingberd, the Chief of the Imperial General Staff (CIGS). At the time, it was named The Mobile Division. The choice of General Officer Commanding reflected the tensions within the army. The Secretary of State for War (Leslie Hore-Belisha) wanted a Royal Tank Corps (RTC) officer as tanks would be the main force of the division but Montgomery-Massingberd wanted a cavalry officer. Supporters of Montgomery-Massingberd proposed that the tank element of the division should be formed from cavalry regiments equipped only with light tanks and that the tank brigade and its heavier tanks be removed from the division. The compromise was the appointment of Major-General Alan Brooke RA. When Brooke was promoted, his replacement was a cavalry officer. The Mobile Division was formed with the 1st and 2nd Light Armoured Brigades, the 1st Army Tank Brigade, artillery, engineers and signals. Its paper strength was 620 armoured fighting vehicles but ​7⁄8 of these were reconnaissance vehicles and some were simulated by trucks. The heavier tanks were in the tank brigade, which had obsolete medium tanks until cruiser tank deliveries began in December 1938. At the same time, the organisation of the division was changed to a Light Armoured Brigade (three regiments with light and cruiser tanks), a Heavy Armoured Brigade (three regiments of cruiser tanks) and a Support Group (motorised rifle battalion, motorised artillery regiment and a company of engineers). In practice, with insufficient cruiser tanks to equip the division, there was no difference in numbers and type of tanks between the light and heavy brigades. The 1st Armoured Division first saw service during the Second World War in incomplete form under the command of Major-General Roger Evans when the second British Expeditionary Force (2nd BEF) was sent to France in May 1940. The 1st Armoured Division, consisting of the understrength 2nd and 3rd Armoured Brigades, along with the 1st Support Group, and with no infantry support (which had been transferred in April to form the 30th Infantry Brigade), landed in France on 14 May 1940 and, after suffering heavy tank losses during the Battle of France, was evacuated to England on 16 June, having fought south of the river Somme, isolated from the other British formations. Cruiser Mk I tanks of the 5th Royal Tank Regiment, 1st Armoured Division, on Thursley Common, Surrey, July 1940. Until 27 August 1941, the division was stationed in the United Kingdom on anti-invasion duties, anticipating a German invasion, under the command of Major-General Willoughby Norrie, who had taken command on 24 August 1940. It then embarked for Egypt under the command of Major-General Herbert Lumsden and arrived on 13 November 1941. After Major-General Lumsden was wounded, Major-General Frank Messervy took command in January 1942, retaining command until Major-General Lumsden returned in March. The 1st Armoured Division took part in many of the battles of the North African Campaign against Generalfeldmarschall Erwin Rommel, the "Desert Fox", including Gazala, Mersa Matruh, First El Alamein, Second El Alamein, Tebaga Gap, Mareth Line, Akarit, El Kourzia and Tunis. In August 1942, Major-General Raymond Briggs was appointed to command and in July 1943 was succeeded by Major-General Alexander Galloway. Sherman tanks of the 2nd Dragoon Guards (Queen's Bays), 1st Armoured Division, at El Alamein, 24 October 1942. From the end of the campaign in Tunisia in May 1943, which saw the surrender of almost 250,000 German and Italian soldiers, the 1st Armoured Division remained in North Africa until May 1944. The division, minus the 18th Lorried Infantry Brigade (previously 7th Motor Brigade, on loan to the 1st Infantry Division in the Anzio beachhead, only rejoining 1st Armoured in August), then transferred to the Italian Front, arriving in Italy in late May. The division came under command of V Corps, under Lieutenant-General Charles Keightley, of the Eighth Army, commanded by Lieutenant-General Sir Oliver Leese. The 1st Armoured Division was the only British division, of six in total, to have fought at Alamein under Eighth Army command, to rejoin the army in Italy. During the fighting in front of the Gothic Line throughout August and September, the 2nd Armoured Brigade suffered severe losses in tanks in the Battle of Coriano, with the 2nd Dragoon Guards (Queen's Bays), losing 31 tanks, out of 52. Major-General Richard Hull, aged just 37 and three months who became Chief of the General Staff, took over command for this part of the campaign in August 1944. The division was broken up soon after, due to a lack of sufficient drafts to replace casualties; the 2nd Armoured Brigade survived as an independent brigade and the 18th Infantry Brigade was broken up and used to fill gaps in other British divisions, mainly for the 46th and 56th Infantry Divisions. The division was officially disbanded on 11 January 1945. The 1st Armoured Division was constituted as follows and shows some of the changes that were made to British armoured formations during the war. 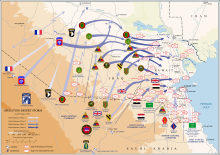 Ground operations during Operation Desert Storm, showing the 1st Armoured Divisions movements. It was not until 1960 that the Division re-emerged in the British Army. It was reformed as the 1st Division following the disbandment of the 1st Infantry Division and was initially based with the British Army of the Rhine at Verden an der Aller in West Germany. During the 1970s, the division consisted of two "square" brigades, the 7th Armoured Brigade and 22nd Armoured Brigade. It became the 1st Armoured Division in 1976 and served with I (BR) Corps being based at Caithness and Shiel Barracks in Verden in Germany from 1978. After being briefly reorganised into two "task forces" ("Alpha" and "Bravo") in the late 1970s, it consisted of the 7th Armoured Brigade, the 12th Armoured Brigade and 22nd Armoured Brigade in the 1980s. The divisional badge dates from 1983, and combines the hollow red triangular "spearhead" badge of the 1st Infantry Division with the charging rhinoceros badge of 1st Armoured Division as displayed in the Second World War. The headquarters of the division was deployed to Saudi Arabia in 1990 to command British land forces. It had the 4th Armoured Brigade and 7th Armoured Brigade under command. During the war, it came under the US VII Corps and was part of the great armoured left-hook that destroyed many Iraqi Republican Guard formations. The two brigades in the division alternated heading the advance. The division participated in the Battle of Norfolk. During this engagement the division destroyed several Iraqi companies of T-55 tanks. After 48 hours of combat, the division destroyed or isolated four Iraqi infantry divisions (the 26th, 48th, 31st, and 25th) and overran the Iraqi 52nd Armoured Division in several sharp engagements. The British 1st Armoured Division had traveled 217 miles in 97 hours. The British 1st Armoured Division had captured or destroyed about 300 tanks and a very large number of armoured personnel carriers, trucks, reconnaissance vehicles, etc. The division also took over 7,000 Iraqi prisoners of war including two division commanders and two other general officers. 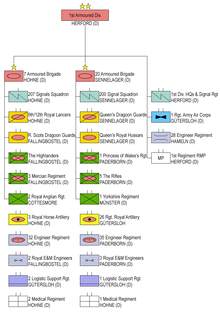 Structure 1st Armoured Division before the Army 2020 changes. In 1993, HQ 1st Armoured Division was disbanded and the 1st (UK) Armoured Division formed from the 4th Armoured Division. The headquarters were established at Wentworth Barracks in Herford in 1993. The divisional headquarters was deployed in command of the Multi-National Division (South-West) in Bosnia in 1996–1997 and 1998–1999. The Division headquarters again deployed to the Persian Gulf area in 2003. It again commanded British forces in the area, this time with three full brigades under its control. Those were 7th Armoured Brigade again, along with 16 Air Assault Brigade, and 3 Commando Brigade. In a combined arms operation, the division secured southern Iraq, including the city of Basra during the invasion. It came under I Marine Expeditionary Force during the 2003 conflict. "Land Command Shapes Up", Jane's Defence Weekly, 15 July 1995, should confirm details of the structure of 1st Armoured Division in the mid 1990s. The division moved to Imphal Barracks in York on 1 June 2015. ^ 63 light tanks, 205 medium tanks, 24 close support tanks, 25 anti-aircraft tanks and 8 artillery observation tanks. ^ These two figures are the war establishment of the division for 1944–1945; for information on how the division size changed over the war please see British Army during the Second World War and British Armoured formations of World War II. ^ Niehorster, Dr. Leo. "1st Armoured Division, British Army, 03-09-1939". World War II Armed Forces. Orders of Battle and Organisations. Retrieved 22 December 2015. ^ Niehorster, Dr. Leo. "1st Armoured Division, 23 October 1942". World War II Armed Forces. Orders of Battle and Organisations. Retrieved 22 December 2015. ^ "Shiel Barracks". BAOR Locations. Retrieved 27 October 2015. ^ "Badge, formation, 1st Armoured Division & 2nd Armoured Brigade". Imperial war Museum. Retrieved 23 October 2017. ^ "Challenger 1 Main Battle Tank". Global Security. Retrieved 25 October 2017. ^ "Wentworth Barracks". BAOR locations. Retrieved 27 October 2015. ^ "Army 2020 Report" (PDF). Ministry of Defence. Retrieved 12 July 2013. ^ "Division Redesignated to 1 (UK) Division". Ministry of Defence. Retrieved 21 July 2014. ^ "Who we are, 1st (United Kingdom) Division". Ministry of Defence. Retrieved 7 December 2018. ^ "Homecoming of a Yorkshire general". The Press. 4 June 2015. Retrieved 10 August 2015. Joslen, Lieutenant-Colonel H.F (1960) . Orders Of Battle Second World War 1939–1945. Naval & Military Press Ltd. ISBN 978-1-84342-474-1. Chappell, Mike (1986) . British battle insignia, volume 2. Osprey. ISBN 978-0-85045-727-8. Bourque, Stephen A.; Burdan, John (2007). The road to Safwan the 1st Squadron, 4th Cavalry in the 1991 Persian Gulf War. Denton, Tex: University of North Texas Press. ISBN 9781574412321. Wikimedia Commons has media related to 1st (United Kingdom) Division.